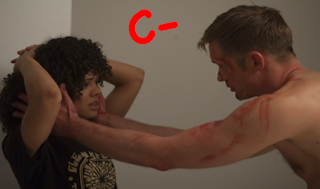 Terry Monroe (Alexander Skarsgård) and Bob Bolano (Michael Pena) are cops. They are the type of cops that bad guys have a run-in with and go away saying: “Who is worse? Me or those cops?” They are corrupt cops. That’s putting it lightly. It’s a crapshoot if their boss (Paul Reiser) and fellow officers on the department’s payroll are much better, but these cats were well on their way to being fired LONG before the events of this movie started. Being unhappy with themselves and naturally impulsive by nature, they chase down every scummy drug-dealer, pimp, and kingpin they can find. They extort them and get rid of them, either by offing them or locking them up (usually the former), depending on how big of an offender they happen to be. When some small-time hustles put them in touch with “Lord James Mangan” (Theo James), the stakes get higher. What do we, the audience, get? A very clever script that makes us laugh. It goes nowhere, but it damn sure makes us laugh. Of the real bad guys, we get this Mangan fellow. He’s intended to be interesting, but he’s a fill-in for what is supposed to look like a complex, cigarette-smoking, and very reflective villain whose dark compulsions you don't want to be the target of. But it becomes painfully obvious that he’s just a shell. He has no real substance behind his conception. He is up there with “Dominic Greene,” the forgettable James Bond villain. His cohort, “Birdwell” (Caleb Landry Jones), is doing quite a bit better. 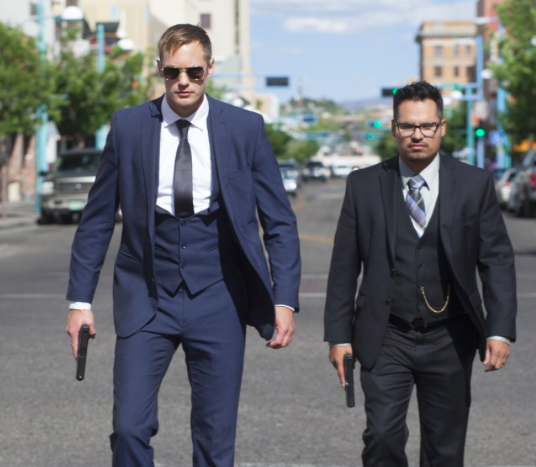 War on Everyone starts out strong and quickly grabs our interest. It maximizes screentime and provides ample entertainment. It does well by including talents like Tessa Thompson as “Jackie Hollis,” Monroe’s squeeze, but the movie is itself an excursion of humor that goes nowhere. It does nothing because it is nothing, having a letdown for a final showdown and a plot-twist-lacking unfolding that can't help but be noticed. Unfortunately, we walk away feeling like what we saw was a so-so investment of our time at best, which is double-unfortunate since we can see throughout that the writing behind McDonagh’s script definitely had the chops to succeed.